There are 387 confirmed measles cases this year, according to the Centers for Disease Control and Prevention. 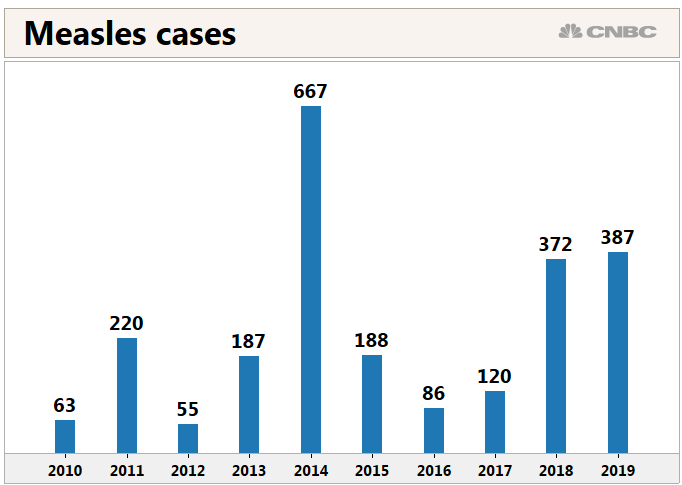 This year is shaping up to be the worst year for measles since at least 2014. New York's Rockland County bans unvaccinated children from public places. Nurse Lydia Fulton prepares to administer the measles, mumps, and rubella (MMR) vaccine as well as a vaccine used to help prevent the diseases of diphtheria, pertussis, tetanus, and polio at Children's Primary Care Clinic in Minneapolis, MN, Friday April 28, 2017. The CDC has confirmed 387 cases across 15 states from Jan. 1 through March 28, compared with 372 cases in all of last year. The health agency updates the statistics weekly. There are now six outbreaks, defined as three or more cases, across four states: New York, Washington, New Jersey and California, according to the CDC. 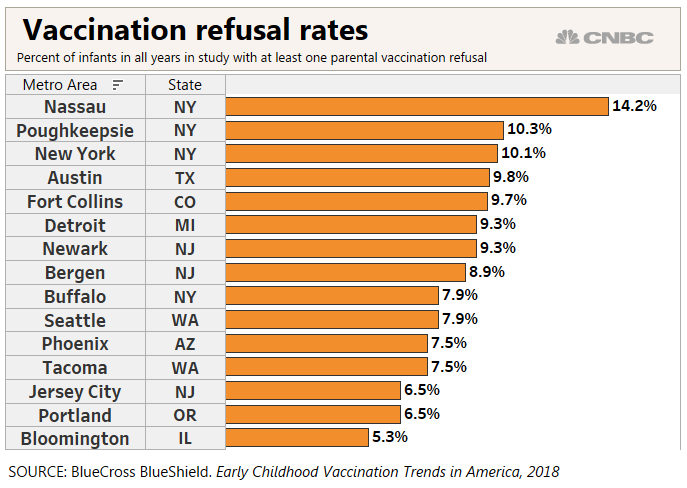 New York's Rockland County last week took the extraordinary step of banning unvaccinated children from public places such as schools, restaurants, malls and places of worship. There have been 157 confirmed cases of measles in the county, and the overwhelming majority of those people had not received the vaccine, according to the county. Cheryl Healton, dean of New York University's College of Global Public Health, said she has some sympathy for the county health department in taking this action. However, she worries it could embolden parents who refuse to have their children vaccinated, known as anti-vaxxers. "It's a carrot or a stick. They chose the stick. There's a lot of evidence the carrot works better than when you use the stick, that's why it's not used. You can get a better response by appealing to people's higher nature," she said. Measles can be especially dangerous for young children, the CDC says. It can lead to pneumonia, brain swelling and even death. The CDC recommends children get their first dose of MMR vaccine at between 12 and 15 months old and a second dose when they're between 4 and 6 years old. The CDC says the current measles outbreaks in the U.S. are mostly linked to people traveling internationally to countries such as Israel and Ukraine that are experiencing large outbreaks. It's spreading quickly in close-knit religious communities, such as New York's Orthodox Jewish community, where many people choose not to get vaccinated. Public health officials are desperately trying to assure parents that vaccines are safe and are the best way to protect their children from dangerous and potentially deadly diseases such as measles. The anti-vaxxing movement, which advocates against vaccination, has been pushing now-debunked studies that falsely suggested there was a link between vaccines and autism.